I briefly mentioned in my previous post here (and the one from yesterday on SiliconANGLE) that the new “like” functionality from Facebook isn’t going to be useful for small to mid-sized content producers. I saw my first “like” implementation in the wild just now. Over at Techmeme. This may not be the best example, but I think it illustrates my issue with the Like button: it’s not that useful from either a publisher perspective, and certainly not from a user perspective in this sort of implementation. Where does that Like go? 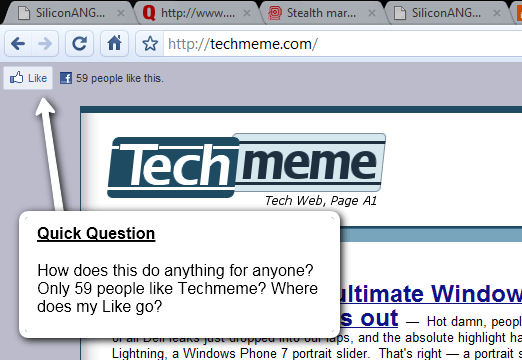 More importantly, are there really only 59 people who like Techmeme? Is my “like” for Techmeme indicative of a permanent state of affinity or is for whatever the headline at the time might be? This is probably not Techmeme’s permanent implementation, but I watched the number actually stay exactly the same as I reloaded the site once every five minutes over the course of a half hour or so. All this to say to my panicking and outraged friends – this isn’t going to work for everyone, and that will be quickly realized by the early adopters of these new features.